Outsource Accelerator’s outsourcing white paper offers expert solutions to common BPO problems and challenges. We publish a wide array of white papers that specifically discuss the different areas and aspects of the outsourcing industry in the Philippines. We also produce white papers that talk about general topics such as the future of outsourcing and why it is a win-win solution for outsourcing clients, employees, service providers, and all the other stakeholders. White papers are important to identify potential problems, provide solutions, and disclose significant information on certain topics. Our position papers are created with clear objectives in mind so that our clients and readers get the most benefit out of them. All of them are highly valuable, carefully written with accuracy by our best researchers and consultants who have tons of experience when it comes to actual outsourcing in the Philippines. If you are looking for the best Philippine outsourcing white papers, then you have come to the right place! Continue to navigate our website for more unbiased and independent information about the outsourcing industry. Outsource Accelerator produces the best Philippine outsourcing white papers with the welfare of our clients and readers in mind. We publish many position papers on different areas of the industry, including the future of outsourcing white paper, BPO white paper, CPO white paper, online outsourcing white paper, and the Philippine economy white paper. With these white papers, we are able to help business owners further deepen their knowledge of the field and manage common risks and challenges that come with being an outsourcing beginner. Even those who have already outsourced for years will also benefit from our well-curated BPO white papers that remain relevant even with the passage of time. Outsource Accelerator provides 100 percent unbiased and expert-level assessment of the BPO industry in the Philippines. We specialize in Philippine outsourcing because we believe that the country is a great option as an outsourcing destination right now. Our position papers reflect this belief, and we focus not only on the solutions but also talk about the benefits of outsourcing in the Philippines. Our white papers provide up-to-date facts that will answer most of your outsourcing questions and concerns. If you are just beginning in your outsourcing journey, then our position papers are the best reading materials to start with. Our papers will educate you about potential issues and challenges that you may face and, more importantly, offer practical and realistic solutions to these problems once you have identified them. Other than that, our white papers also provide reasons why outsourcing is the next best move to grow your business. They answer some of the most basic questions by business owners that hesitate about going into the process, such as: How does outsourcing generate savings? How long can we feel its positive effects? Will it affect our company’s employee turnover? How does it influence the morale of existing employees? Is the industry stable? How bright is the future of outsourcing? Check out our list of white papers below and read at your own pace. These position papers are designed to provide you an extensive amount of information to ensure that you are not in the dark when it comes to Philippine outsourcing. We also invite you to download our powerful outsourcing starter tool kit. This beginner’s outsourcing tool kit is meticulously compiled to prepare you to begin the process of outsourcing. You do not have to be hesitant anymore. Read our recommended white papers below and download our comprehensive starter kit. Fully equip yourself and be more confident in the exciting and challenging world of outsourcing with these white papers! 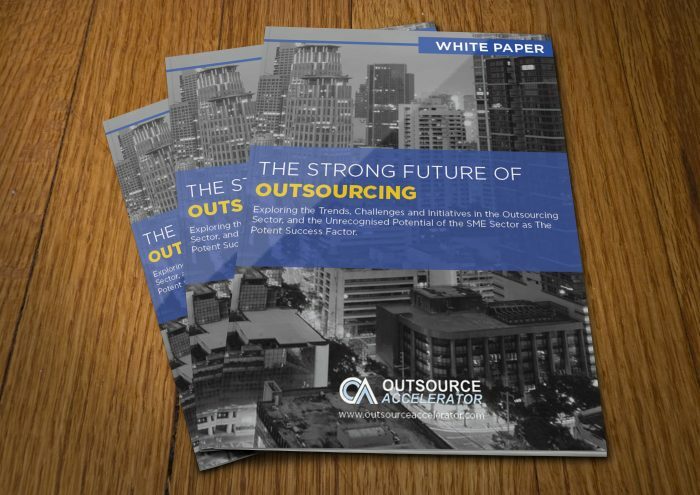 We believe in the strong future of the outsourcing industry, and some of our white papers tackle this specific topic. Despite some rumors that the BPO outlook seems bleak, we offer position papers that refute these kinds of talks. Outsourcing is currently deemed as the future of work with many modern and progressive companies relying on outsourcing for continuous business growth and development. However, there has also been an ongoing misconception that the practice is on a gradual decline because of the advancement of artificial intelligence (A.I.) and system automation. There had always been that false impression of machines being more capable of handling fundamental work tasks that are routine in nature. This is just one fallacy that our future of outsourcing white paper is trying to prove false. We are not saying that automated systems are inefficient. It is true that A.I. systems perform an excellent job in terms of basic everyday work functions, especially when it comes to the scale of large corporations with thousands of employees. A dose of automation completes simple tasks at the fastest possible time. However, it is also true that these automated systems are prone to get hacked or to malfunction for various reasons. Some of these glitches may even happen in the most inconvenient time for a business or company. This is why we promote outsourcing as the best option. We trust in the capability and reliability of real human beings to think and adjust according to situations. We still believe that nothing beats the intuition and decision-making prowess of a living and breathing worker. Some of our white papers support that conviction, and thus we communicate the strong future of the BPO industry. If you are thinking twice about outsourcing, then this academic white paper will help you change your mind. Not only will it persuade you to try outsourcing, but it will also help you understand how over time your business can benefit through the practice. We think that the future of outsourcing will rely on small-to-medium-sized businesses. Since the costs of outsourcing reduced in the past few years, millions of Western-based SMEs have then taken advantage of the practice and have continued to reap the benefits. Our white papers mainly talk about the vibrant outlook of Philippine outsourcing. If you are looking for accurate and reliable information about the future of outsourcing in the Philippines, then our readily-accessible white papers will help you find what you are searching for. Access our white paper pages now to learn more about the future of outsourcing to the Philippines and how your business can benefit from it. 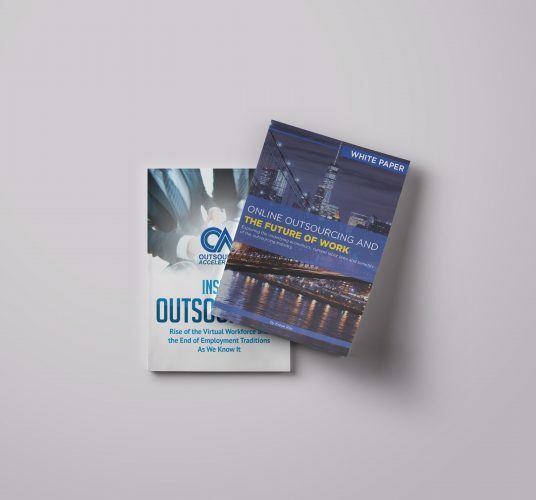 Outsource Accelerator is proud to publish Korok Ray’s powerful these concerning outsourcing and the future of work. Korok earned a BS in mathematics from the University of Chicago and a PhD in economics from Stanford University. He has taught at the University of Chicago and Georgetown University, as well as Texas A&M University. He also served on the Council of Economic Advisers of the White House from 2007 to 2009 during the historic financial crisis. Read and download his full thesis, Online outsourcing and the future of work, here. Outsource Accelerator provides independent and unbiased outsourcing advice to our clients. However, we are biased when it comes to recommending that outsourcing to the Philippines is your best option to start with the practice. While we recommend that all companies should consider outsourcing, we particularly suggest beginning it in the Philippines. Why? Because of the many inherent benefits, you can gain by doing it in the said country. For one, the Philippine government is fully supportive of the industry. Another advantage is the Filipino’s intrinsic culture of hospitality and courtesy that is key for service-oriented jobs. Also, most Filipinos already understand and speak the English language fluently, which saves training time and costs. Our Philippine outsourcing white paper explains in detail the advantages of outsourcing in the Philippines. It also provides relevant and updated information about the current economic state of the country as well as the typical salaries and compensation of Filipino workers. All these details are necessary to ensure your outsourcing success in the country, even if you are doing it for the first time only. 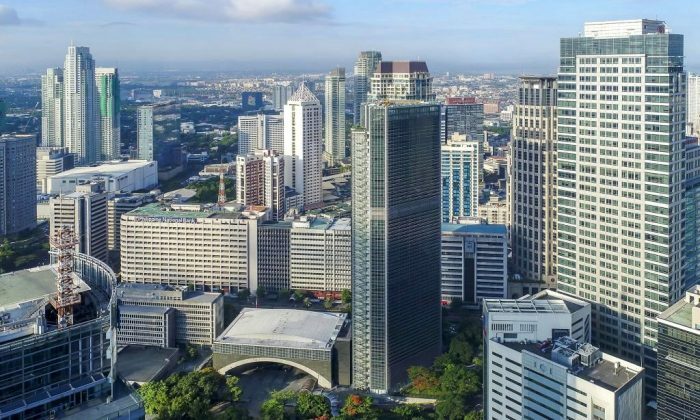 We believe that the Philippines is one of the leading outsourcing nations today, and that is highlighted with the Philippine outsourcing white paper that we published in this page. We believe that outsourcing has become the Philippines’ best export and that the future of the industry in the country is quite bright. Our outsourcing white papers will give you a complete picture of the industry’s status in the country, giving you more confidence and preparing you for the inevitable decision to outsource. Our position papers regarding this topic also explain how hundreds of high-quality Philippine BPO firms exist today, and how each one of them is eager to accommodate the needs of the Western SME market. Do you know that you can save over 80 percent of your company’s total labor costs just by outsourcing to the Philippines? We try to explain this to our clients using our comprehensive guides and white papers. We believe that the supply for outsourcing is already here, particularly in the Philippines, and our white papers and guides act as some of the communication tools to get the word out there in the global arena. 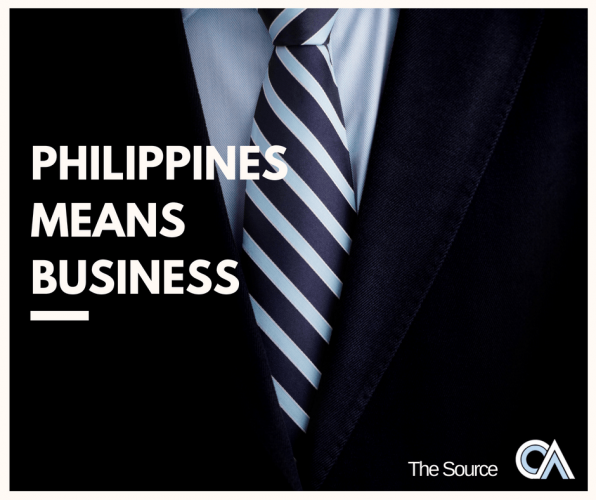 Reading our white papers will make you more equipped to outsource in the Philippines. We want to make sure that you succeed in your outsourcing endeavors. We want you to get it right the first time, and providing you with all-inclusive Philippine outsourcing white papers is just one of our ways to get the job done. Are you looking for an in-depth article about the Philippine economy before beginning to outsource in the Philippines? Some of our white papers talk about the current state of the country’s economy and discuss how the outsourcing industry was able to have a huge positive impact on it. Aside from significantly cutting down labor costs, Western-based businesses that outsource to the Philippines have helped raise the wages of Filipino workers in multiple industries. A USD$600 (Php30,000) per month salary is considered low for Western companies, but in the Philippines, it is already enough to provide for an employee and his family. As a result, this wage increase has helped propel the Philippine economy from once being a laggard in Asia into the healthy one that it is now. Our Philippine economy white paper explores the economic disagreements for and against outsourcing to the country. We believe that outsourcing to the Philippines is a win-win situation for any BPO company and its clients as both can benefit from their partnership in the long run. Our white papers go deeper into this by giving you an accurate representation of both sides of the story: the pros and cons of outsourcing in the Philippines as well as its political impact on the nation and the country of the outsourcing client. Reading our Philippine economy position papers will allow you to have a better understanding of the outsourcing situation in the country, which enables you to arrive at the best strategies and decisions to make before starting the process. Our white papers also discuss how the industry’s evolution was able to turn former outsourcing problems into benefits for both company and client. It addresses the common outsourcing criticism that outsourcing to developing nations steals jobs from Western workers. By understanding how everything works in reality, you will be able to debunk these misconceptions yourself. Check out our Philippine economy white papers and understand better how the industry has helped boost the country’s economy as well as the lives of many of its ordinary workers. Why outsourcing is a win-win white paper. Outsourcing is a win-win solution for both the service provider and its client as it benefits them both in many ways. Of course, as in all systems or industries, there are also risks and drawbacks to outsourcing. However, the evolution of outsourcing has allowed experienced outsourcers to turn these issues into advantages for all stakeholders involved. Outsource Accelerator’s white papers delve into these topics and show how at the end of the day every outsourcing stakeholder can benefit from the process. 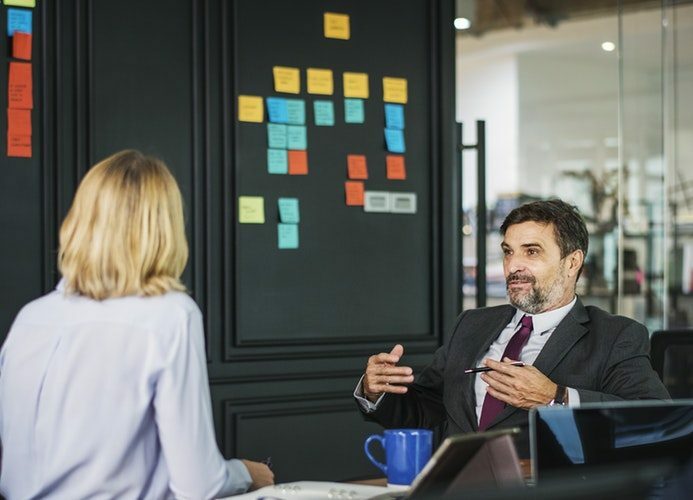 Having this kind of understanding will empower you to make more confident and favorable decisions that would allow your business to continue to grow and expand. We believe that outsourcing is an inevitable part of the current global economy, and businesses that do not take advantage of this trend would fail to adapt to the modern times. We believe that companies that are more tolerant of these changes can become more resilient, thus will have the ability to stay in business longer than those who do not. Our white papers will help you gain knowledge on how to adapt to these times and make the most out of outsourcing to the Philippines. 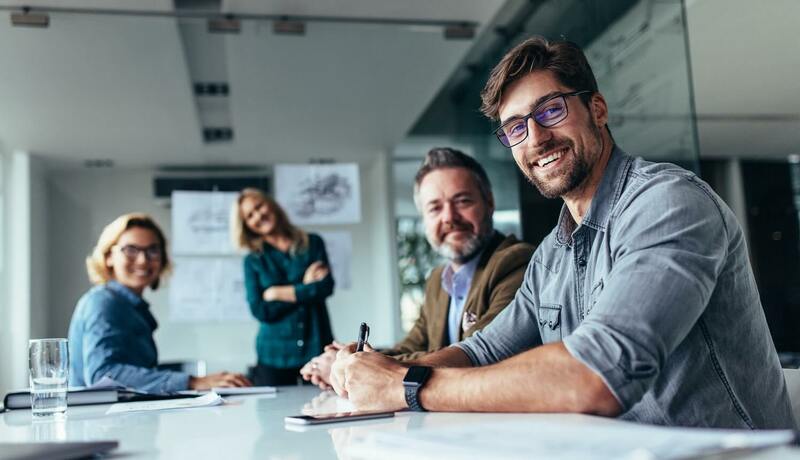 With more than enough knowledge of the industry, you gain confidence in your next moves and will have a clearer perspective of the big picture in terms of where your company is headed ultimately. 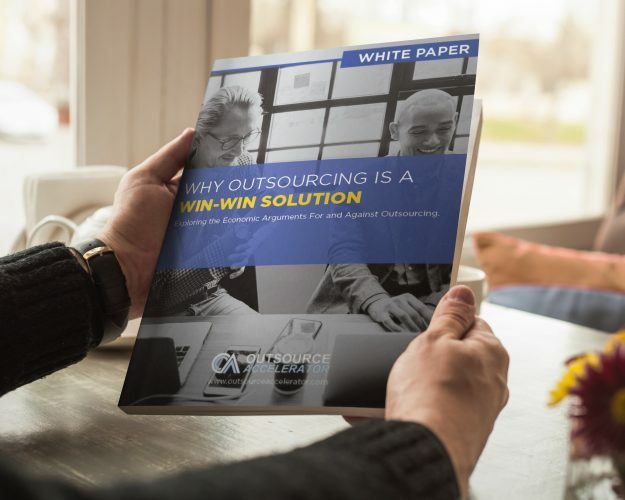 Check out Outsource Accelerator’s outsourcing white papers now and learn about the practical solutions for potential outsourcing problems and challenges. Know more about the industry in the Philippines as well as the country’s current economic state.